A new easy weekday recipe! 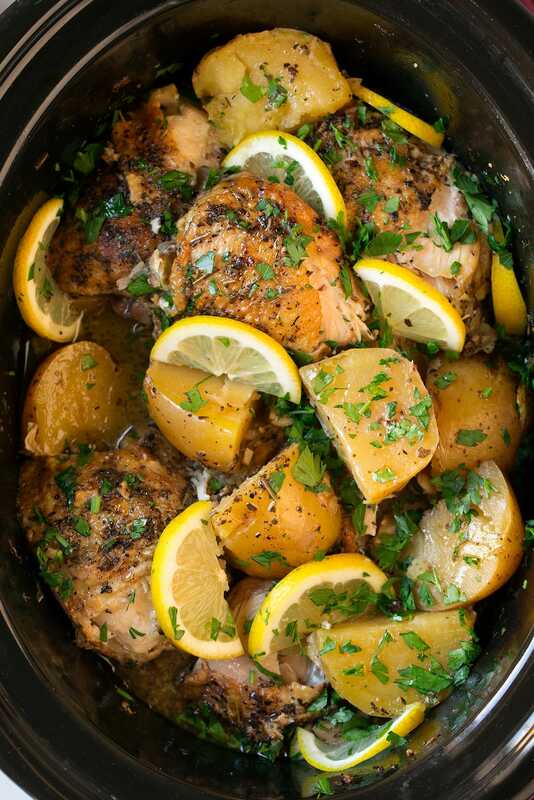 This Greek Slow Cooker Lemon Chicken and Potatoes has such a delicious bright flavor and it’s oh so tender. A perfect meal for busy weekdays! It’s recipes like this that remind me I should be using my slow cooker a lot more often. You get that fall-off-the-bone tender chicken and well softened potatoes that have cooked for 7 hours and soaked up alllll that flavor. Plus, it allows time for all those flavors to blend and marry together. I also love the way those fattier thighs melt into the broth and create such a delicious sort of pan sauce. 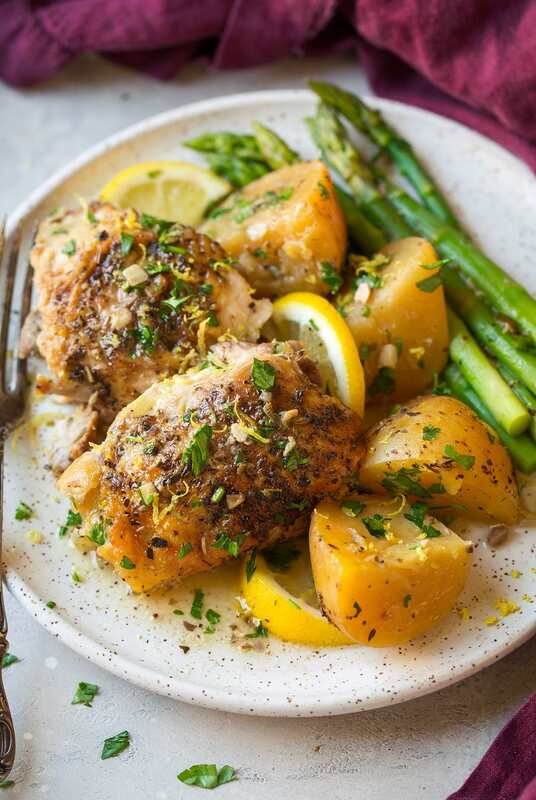 Recipes like this Greek chicken and potatoes are always great in my book, not only because they are easy and ready when you get home from wherever, but they’re also the kinds of recipes that the whole family loves. Husband approved, kid approved and grandma approved (my mom lives with us and she was loving this dinner too, and she doesn’t normally care for chicken thighs). Place potatoes and onions in an even layer in cooker. Pour in chicken broth. Sprinkle with half the garlic, half the oregano, half the basil and half the rosemary then season with salt and pepper. Working in two batches, dab skin side of half the chicken thighs dry with paper towels, season with salt and pepper, then sear until golden brown. 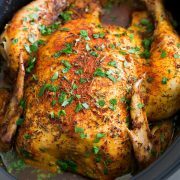 Transfer chicken to slow cooker over potato layer. Repeat with remaining thighs. Slowly and evenly pour lemon juice over chicken thighs, then sprinkle in remaining half the garlic, oregano, rosemary and basil over chicken. Sprinkle 1 tsp lemon zest over chicken. Cover and cook on low heat 5 1/2 – 7 hours. Serve warm and sprinkle with fresh parsley and remaining lemon zest. Lately I haven’t been a big fan of chicken breasts in the slow cooker because they can tend to dry out and the texture just gets weird, unless they only cook for about 4 1/2 – 5 hours. But, if I were to try boneless skinless chicken breasts here, I’d skip the browning because that would pretty much cook them to begin with. Then I’d add in some olive oil into the slow cooker since you don’t get the fat from the thighs and skin. And as mentioned, I’d reduce that cooking time — I’m thinking 5 hours max (but as always just test with an instant read thermometer to 165 degrees in center of thickest portion). If you do try chicken breasts please do let me know how they turned out. I love to get feedback and reviews! Can I Cook This on High for a Shorter Amount of Time? Technically, yes. But I recommend cooking it on low for the longer amount of time. This makes the chicken super tender! Note that the lemon slices were only added at the end for looks, I don’t recommend cooking them with the potatoes and chicken because that white pith of the lemon adds a bitter flavor. I don’t recommend skipping the step of browning the chicken skin first. It adds a layer of flavor that would definitely be missed. 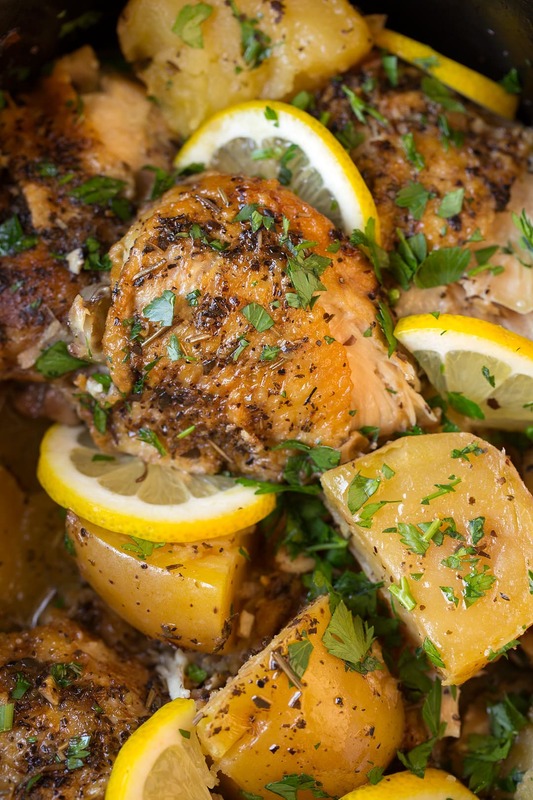 Reserve some of the lemon zest for sprinkling over the Greek chicken and potatoes as you’re serving it. 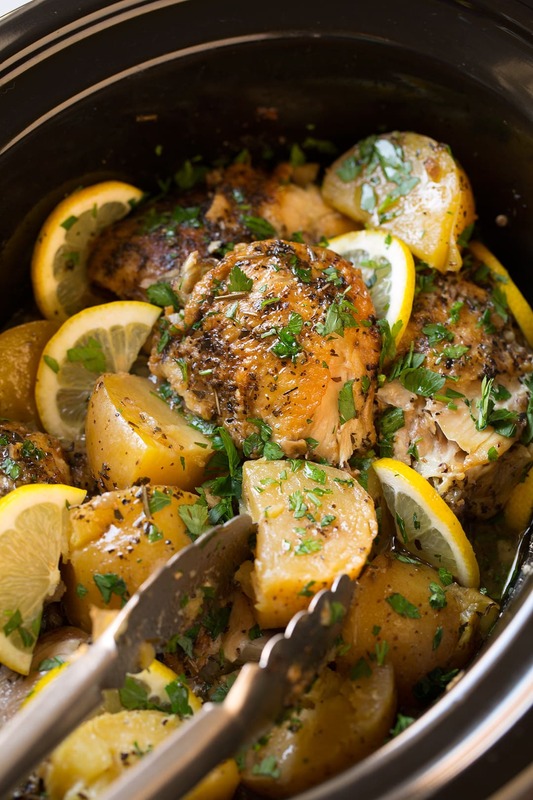 An easy and hearty slow cooker lemon chicken and potato recipe! So tender and full of bright flavors. Perfect for busy weekdays. For one more veggie add in some fresh asparagus near the last 20 - 30 minutes of cooking. 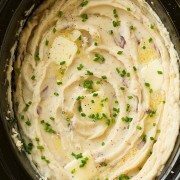 Place potatoes and onions in an even layer in a 6-quart slow cooker. Pour in chicken broth. Sprinkle with half the garlic, half the oregano, half the basil and half the rosemary then season with salt and pepper. Heat oil in a large heavy bottomed pot over medium-high heat. Working in two batches, dab skin side of half the chicken thighs dry with paper towels, season with salt and pepper then sear in pot, skin side down, until golden brown, about 4 minutes. 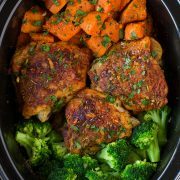 Transfer chicken to slow cooker over potato layer. Repeat with remaining thighs. Slowly and evenly pour lemon juice over chicken thighs, then sprinkle in remaining half the garlic, oregano, rosemary and basil over chicken. Sprinkle 1 tsp lemon zest over chicken (reserve remaining 1 tsp in a container in refrigerator until ready to serve). Cover and cook on low heat 5 1/2 - 7 hours. Serve warm spooning some of the slow cooker juices over each serving, sprinkle with fresh parsley and remaining 1 tsp lemon zest. Note that the lemon slices were only added at the end for looks, I don't recommend cooking them with the potatoes and chicken because that white pith of the lemon adds a bitter flavor. Shanon: Really good! Though using thighs for me always negates the time I would like to save using the crock pot due to trimming. I’ll bet this would have tasted just as good had I used breasts… although it wouldn’t have been as pretty!